AESA radars have changed aerial combat, offering a quantum leap in range, resolution, fast scanning capabilities, stealthiness and reliability among many other advantages. But, an AESA’s somewhat narrow field of view can still be an issue. SAAB has come up with a ingenious solution to this problem—spin an angled AESA radar array around on a platter. This system, which is called a repositioner, is ingenious as it allows the Gripen NG’s Raven ES-05 radar to gain another 40 degrees of scanning ability to either side of the aircraft’s nose. This is in addition to the 60 degrees AESA radar sets typically provide (120 degrees combined). The ability to take a beyond-visual-range missile shot, then turn 90 degrees, while still providing mid-course updates for the missile fired and keep situational awareness at its peak is a great thing, and it opens up many tactical advantages for Gripen NG crews. This system will allow beaming into the enemy’s radar notch without losing track of the bad guys. Beaming is when a fighter turns around 90 degrees away (perpendicular) from the enemy’s pulse doppler radar array. Because these types of radars use doppler shift to gauge a target’s relative velocity, and as such they filter out low relative velocity objects, especially ground clutter, the beaming fighter, which is not moving to or away from the enemy radar much while beaming, can enter the enemy radar’s notch. This is a blind spot where the radar’s velocity gate, which acts like a filter, sees a target at low enough speed from its perspective that it discounts it. So even though the fighter may be moving at 500 mph, the right angle to the radar makes it only detect maybe 60 mph of closure, as such it throws this information out as it would ground clutter. This is an especially useful tactic when the enemy fighter is above you, and trying to lock you up in the look-down-shoot down scenario. The issue is that with a typical fixed AESA radar array, pulling off such a maneuver means the fighter doing so will lose its radar picture and lock on the enemy it is trying to evade. Without third party sensors feeding this data to the beaming fighter via data-link, its pilot will become blind to the tactical situation when it matters most. Now, with a system like SAAB’s repositioner, the radar can be rotated to gain the extra azimuth to continue scanning the area over 90 degrees off its nose. As such, the pilot will not lose situational awareness and their missiles can continue to get mid-course updates as they fly towards their targets. 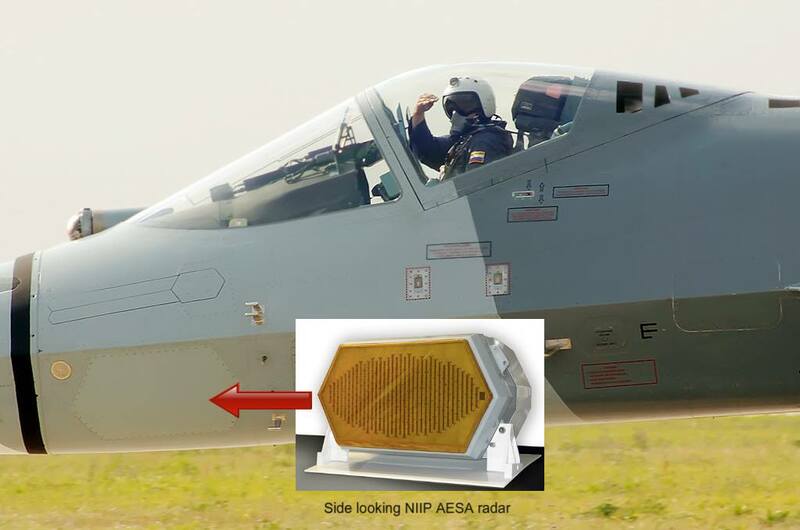 Paired with low-probability of intercept mode, where the AESA radar uses very directed beams of radar energy in quick succession, and while hopping frequencies, the fighter that is beaming can be hard to detect even by passive sensors, such as radar warning receivers. With new missiles that have extreme ranges, like MBDA’s Meteor, a Gripen NG could fire these missiles at enemy fighters at long-ranges, and then jump into the enemy’s doppler notch to hide while still guiding its missiles. This could put the Gripen NG beyond the reach of the enemy’s infrared search and track system (IRST) that is impervious to jamming or beaming tricks during the entirety of the engagement, as well as the enemy’s radar for much of it. As such, the enemy fighters would not be able to detect the Gripen even while its missiles are well on the way. First shots, first kill. Other solutions to this problem have been designed into other fighters. The F-22 Raptor was supposed to have AESA radar arrays on both sides of its nose in order to give the jet more radar coverage at extreme angles. Sadly, the equipment was never installed due to budget reasons. Still, the F-22, with its low observability (stealth) really has less a need for such a system than less stealthy aircraft. Unlike the F-22, Russia’s T-50 has side-mounted AESA arrays, which may be necessary due to the aircraft’s less stealthy design when compared to the F-22. The Eurofighter consortium also has an answer to this problem with their swashplate design tied to the CAPTOR-E radar, which is very similar to SAAB’s repositioner. With the 4.75 generation fighter marketplace looking to be stable much longer than originally anticipated, AESA radar upgrades breathe new life into not so new designs. The Gripen NG in particular packs a ton of capability into a small package, and it will be interesting to see how the jet does once it becomes operational. Currently, Brazil has an order for 36 of the jets (24 single-seat Gripen Es and 12 two-seat Gripen Fs) that should begin being delivered by 2019, and Sweden will order 60.